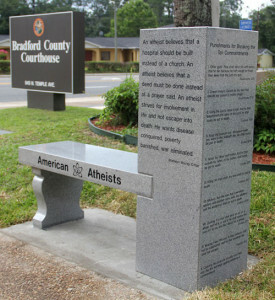 So an Atheist group had a granite bench placed next to a Ten Commandments monument at a Florida courthouse. It has been inscribed with an odd collection of quotes like, “An atheist believes that a hospital should be built instead of a church.” This got me thinking about the tendency of naturalistic humanism to borrow from religion. I’ve decided to start a series of posts detailing this ideological bleed-over. We must learn to invoke the power of ritual and to mark those transitions in every human life that demand profundity – birth, marriage, death – without lying to ourselves about the nature of reality… When we find reliable ways to make human beings more loving, less fearful, and genuinely enraptured by the fact of our appearance in the cosmos, we will have no need for divisive religious myths. The problem here is that in naturalistic humanism, man is a cosmological accident without free will, a “wet robot.” Birth, marriage, and death are just biological necessities, often driven by the function of reproduction. There is no being in control and there is no ultimate purpose for mankind in the universe. This hardly makes us more loving, less fearful, and enraptured by our appearance in the cosmos. Our emotional needs don’t have an answer in naturalistic humanism so they must be “borrowed” from religion. Even Sam Harris doesn’t presume how to do this. That’s not to say that people haven’t tried. I’ll explore some of their ideas in further posts. « Previous PostGod is Good?